Carphone Warehouse, Phones4U, Currys, PC World and Best Buy have all announced that they will be selling the BlackBerry PlayBook when it launches in the UK. RIM's first tablet effort goes on sale in the United States today, although initial reviews have been mixed. The 7-inch tablet totes a 1GHz processor and runs a new OS, BlackBerry Tablet OS which is powered by QNX. 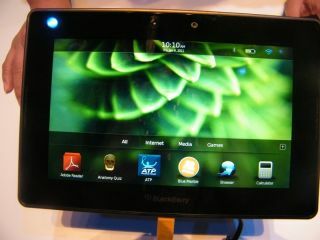 Although most early hands-ons, including TechRadar's own, have been positive, most US reviewers have complained that the tablet is hampered by lack of apps, given that even BlackBerry's stock of handset apps are not compatible with the new QNX OS, although a number of Android apps will be making their way to the slate soon. The other pain point most often referred to is the lack of native email and calendar apps; current users will have to sync the PlayBook to a BlackBerry handset to use these. None of the keen-bean retailers have let slip the BlackBerry PlayBook UK release date or pricing, but you can pre-register for information over at Carphone Warehouse and Phones4U now.